Following the contours of a fairway when root pruning is a great way to prevent distracting, straight lines. Tree roots can cause significant moisture and nutrient stress to turf. As such, many golf course superintendents sever troublesome feeder roots from trees at appropriate intervals to minimize stress to putting greens, tees, fairways and other key areas of the course. A variety of implements can be used to prune tree roots, many of which are described in the USGA article, Getting to the Root of the Problem. 1. Avoid pruning too close to trees – This is not for fear of injuring the trees or damaging your equipment but to prevent unsatisfactory results. Tree roots that cause the bulk of turf stress are not close to the base of trees. Rather, they are often much farther away than you think. The real culprits that cause turf stress are feeder roots that inhabit the upper 8 to 12 inches of soil. Feeder roots can be found well past the drip line of a tree’s canopy. Depending on the tree species, the network of feeder roots can cover an area four to seven times that of the drip line (Perry, 1989). Therefore, it is no wonder why some golf course superintendents have reported dismal results after pruning right next to the base of a tree. 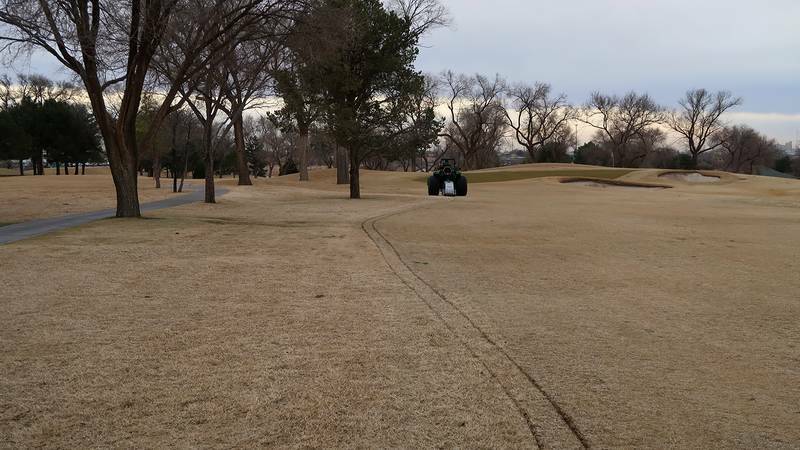 A better approach is to use the drip line as a starting point for root pruning when possible. 2. Follow the contours of the hole – Although cutting perfectly straight lines may be the most time-efficient procedure for root pruning, it is not the most desired. Pruning in straight lines could result in distinct and distracting lines that will make the process more noticeable. Avoid questions and concerns from curious golfers by following natural contours of the hole to create a less obtrusive look. Use fairway edges as a guide and make gentle turns when possible. Perry, T. 0., 1989, Tree Roots: Facts and Fallacies – Arnoldia 49(4):3–29.